HMC is a 5-year research project awarded to David Broman, as part of the Swedish Foundation for Strategic Research (SSF)'s individual grant for future leaders (FFL 6). The project started in January 2017 and has a total funding of 12 million SEK. 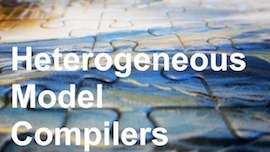 The overall goal of this project is to develop new techniques and tools that make it easier to develop complex systems, by combining heterogeneous models and to automatically generate efficient runtime systems on heterogeneous platforms. The concrete expected output is an open-source model-based compiler that will be directly usable to the industry. For more information about HMC, see the project website. ASSEMBLE is a 5-year research project that is financially supported by the Swedish Foundation for Strategic Research (SSF). The project started in July 2016 and has a total funding of 29 million SEK. The objective of the project is to develop a new probabilistic modeling language together with new machine learning inference algorithms to enable fast and complex development of smart systems. The project team consists of four researchers: From KTH: David Broman and Joakim Jaldén. From Uppsala University: Thomas Schön (main PI) and David Black-Schaffer. For more information about ASSEMBLE, see the project website. These projects are financially supported by the Swedish Foundation for Strategic Research (SSF). This is a personal web page. More information.